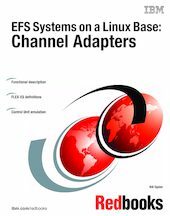 This IBM Redbooks publication briefly describes channel adapters and functions available for use with FLEX-ES. These channel adapters connect FLEX-ES systems through parallel channels and serial (ESCON) channels to typical S/390 I/O devices, including disk drives. New FLEX-ES support, starting with release 7.0, provides more general channel support than was available in earlier releases and includes usage of new serial channel adapters. This document is primarily directed to participants in the IBM internal ITSO/EFS project and to IBM PartnerWorld for Developers members with relevant interests. It is not intended as an introduction to FLEX-ES and readers are assumed to be generally familiar with FLEX-ES definitions and operations as well as general S/390 terminology.